It’s that time of year when your car gets dusty and dirty from the rain. Do you hate waiting in long lines at the car wash? Wait no more; you can have your kids help you wash your vehicle by hand at home! 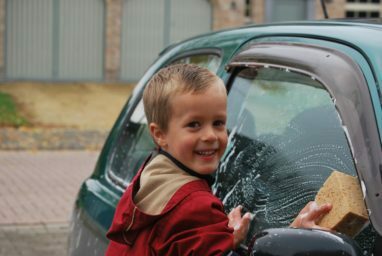 If they are too young to reach the top of your vehicle, you may have to help them wash the top, then let them clean the rest. Solution 1: Pour Dawn dish soap into a bucket, then add warm water. Solution 2: Mix 1 to 3 cups white vinegar, 1 tbsp. of corn starch, and warm water around 1 to 2 gallons. Solution 3: Mix 1/3 cup distilled white vinegar and 1 gallon of warm water. If your car is really dirty, add a few tablespoons of mild dish soap. Have your kids line up on both sides of the car, then have them race to see who can get their side completely covered with soap the fastest. If you have two hoses available, you can have one for each side of the vehicle and they can spray the car as they need before the soap dries. By spraying the car, they are ultimately getting the person on the other side of the car wet, making it a fun game to spray one another. You can also make it a team activity by giving them a certain amount of time to have the car washed and instead of them competing against each other, have them compete against the clock. If it is time to get a new vehicle or if you have one that you no longer use, you can donate it to Wheels For Wishes. We are car donation program that helps local Make-A-Wish chapters. If you would like to find what chapter we benefit near you, click on our chapter locator. Once you find what chapter you would like to donate to, you can give us a call at 1-877-431-9474 or fill out our online donation form. Next, you will receive a call from us within 24 hours of the next business day to schedule your vehicle pick-up. Lastly, you will receive your tax deductible receipt in the mail.